GRAND CANYON, Ariz. — Fire managers of the Fuller Fire – started by lightning June 29 on the North Rim of Grand Canyon National Park – announced Friday a modified closure of roads and trails now that recent rainfall has dampened fire danger in the area. The Fuller Fire has helped clean up dead down trees and debris from the forest floor, which in turn reduces the likelihood of catastrophic wildfire in the future by restoring the natural fire cycle and improving forest health, fire managers said. The portion of FR 8910 that runs north and south in the closure area. 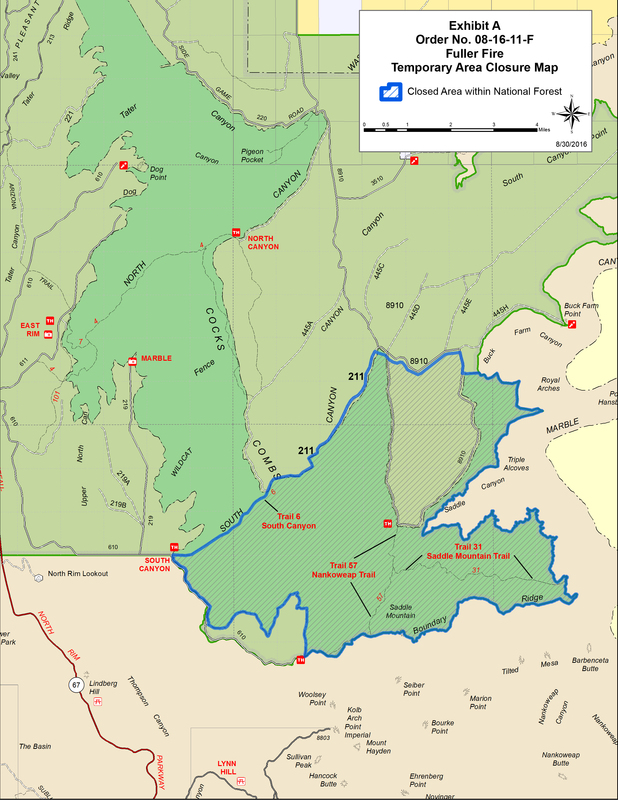 Trails within the Saddle Mountain Wilderness area are closed. These include: South Canyon Trail #6, Nankoweap Trail #57 and Saddle Mountain Trail #31. The boundary of this area closure starts east of Highway 67 at the South Canyon Trailhead off FR 610, heading northeast along South Canyon Trail #6 to the junction with FR 211, then continuing northeast along FR 211 to the junction with FR 8910, then just south of the FR 8910 heading east, then along the Saddle Mountain Wilderness boundary, and back to the South Canyon Trailhead off FR 610. For more recreational information, visitors may call the Kaibab Plateau Visitor Center at (928) 643-7298 or the North Kaibab District Office at (928) 643-7395.